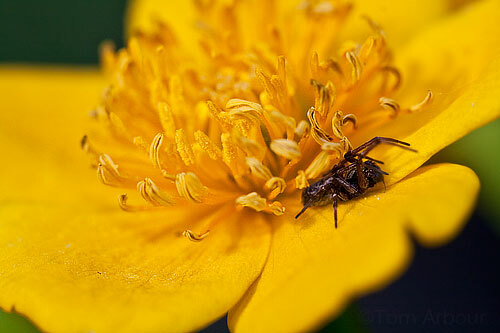 A marsh marigold flower frequented by someone looking for a meal- In our backyard on a plant I recently purchased from Scioto Gardens. Thanks Ruth- This photo was a quick backyard shot but It's really growing on me. Growing on you...pardon the pun? *L* Lovely capture, Tom.